Dies R Us: A Trio of Friends! Can you believe July is almost over! But the happy trio of friends on the card I am sharing today don't seem at all worried that summer is passing so quickly. I decided this darling digi image from Designed2Delight would make a perfect birthday card and I'm so glad I did! 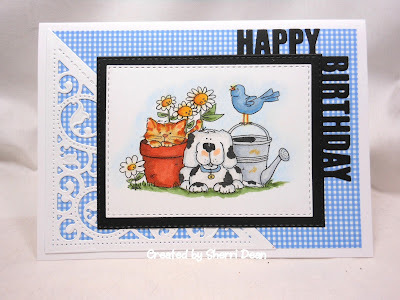 I pulled out just 3 dies for this card: Memory Box Stitched Rectangle Layers, Spellbinders Gold Elements & Die Versions Corner Concept - Happy Birthday. The Happy Birthday die is out of stock as I post this, but you can easily add your name to the waiting list! Besides all the ideas you will get from our Dies R Us Inspiration Blog, be sure you also check out the Dies R Us Challenge Blog as well! New challenges begin on the first & fifteenth of the month with a chance to win a gift card to the fantastic store! I'll be back again next week with something fun! Until then, create your own little piece of art !